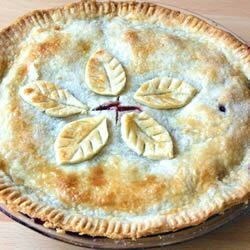 "A fruity and fun surprise awaits you inside this double crusted cherry and blueberry pie." Really?? Baked 15 minutes LESS than recommended, and burnt to a black crisp! Horrible recipe. Turned out perfectly. I used fresh instead of frozen and added about 1 more cup and it turned out great! Everyone wanted the recipe. I am not very good with fruit pies but wow, this was very good and fairly easy to make. I used frozen mixed berries and it was perfect. This didn't last! A definate keeper!